Little House On the Prairie by Laura Ingalls Wilder Book Review! Hi everyone! 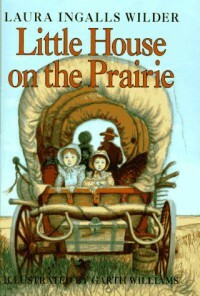 Today I'm reviewing Little House On the Prairie by Laura Ingalls Wilder. In this book the Ingalls family leave the Big Woods of Wisconsin due to the fact that so many people are moving into the woods and scaring of animals. they go of into Indian territory where many hardships await them. This is the most popular book of the series. This is also the first book where the Ingalls family go threw hardships such as wolf packs, prairie fires, sickness, and Indian war cries. It definitely made the book a lot more interesting. Laura still remains my favorite character. I love her relationship with Charles and Jack. I love like Caroline and Mary. In this book we are introduced to a new character named Mr. Edwards. Edwards becomes good friend with Charles and Laura, but Caroline think him to be uncivilized. Though Mr. Edwards may not be my favorite character of the book, I still like him. He was basically the same as he is in the show (which I also love by the way). I don't really have a favorite part, but the part with the wolf pack and the Indians really stand out to me. This was a really good book. I really enjoyed it.